AUGUST. Hi, hello. I hope all is well in your corner of the world. I'm currently at my parents' house in California for the week, working until we head to Lake Tahoe this weekend. My parents live a few hours away from the fires in Mendocino, and it is incredibly devastating to witness their impact. :( Although I live in Colorado, California will always be home. To the men and women of service, thank you, thank you, thank you. Hoping the fires begin to taper off soon. In the meantime, I just donated here — knowing that any bit counts. So, yes, we're headed to another wedding this weekend. 'Tis the season. If you following along on Instagram, you'll know that we were in upstate Washington this past weekend, celebrating the marriage of one of our close family friends. Takeaway: the Pacific Northwest is stunning. Places like Union, Washington feel like the best kept secret. Another takeaway: always pack an extra sweatshirt. You can thank me later. Oh, and one more: if bottles of wine go flying out of your rental car's trunk at the airport, just yell "PARTY!" and inevitably, someone is guaranteed to think it's hilarious. Anyway, I'll recap our trip in other post. We had the best time. And I can't wait to go back. Instead of talking about marriage and wine and the PNW today, we're going to talk about granola. Capeesh? P.S. I just had to Google how to spell that. Capeesh? Capiche? Capisce? Moving on. I love granola. My dad loves granola. My mom loves granola. My sister loves granola, and even my scrambled-eggs-loving brother will eat granola. Albeit my husband is currently on an overnight oats kick, he'll chow down on a bowl of granola too. 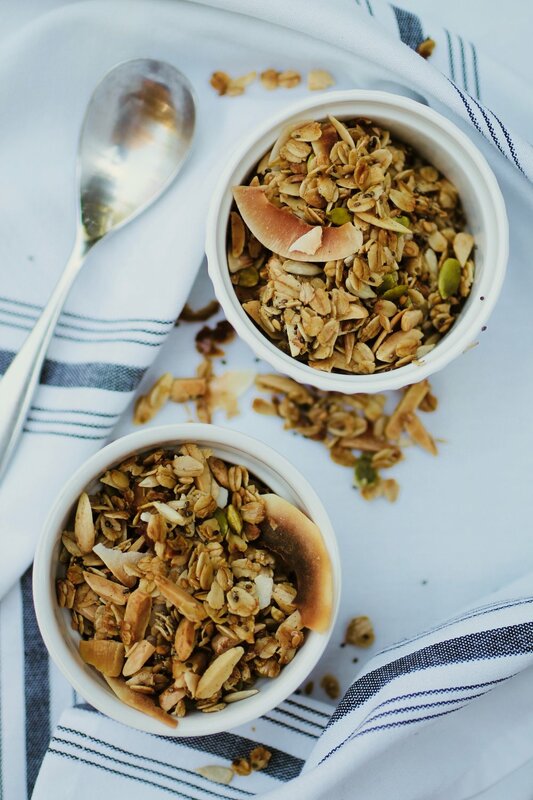 One of the best things about granola is its versatility. If you head to your local grocery store and walk down the cereal aisle, I can guarantee you'll find plenty of options. There's practically something for everyone. There's gluten-free granola, paleo granola, vegan granola, dairy-free granola, low-sugar granola, etc. It's equally mind-boggling as it is impressive. A marketing trap? Maybe. A result of diet culture? Probably. Because something so simple — oats, nuts, seeds, sticky sweetener, oil, and dried fruit — has become fancy and sophisticated and expensive AF. I'd also beg to argue that with the emergence of new diet fads (keto, I'm talking to you), consumers are being manipulated into buying granola without oats. And in my very humble opinion, the base for granola IS oats. Before you tell me I'm wrong, we'll just agree to disagree. Now, there are some brands of granola that I do buy (especially when they're on sale); i.e. Purely Elizabeth. But when I have 35 minutes to spare, making my own is satisfying and therapeutic. And for the most part, homemade granola is pretty forgiving. Just don't let it burn and make sure you have a sticky sweetener on hand. Oh, and don't leave out the oats. This granola is crunchy, cinnamon-y, full of clusters (LET IT COOL! ), and has the perfect amount of sweetness. It's delicious on its own, in a parfait, an accompaniment to hot oats, and sprinkled on top of your morning smoothie. If you don't have all of the nuts and seeds on hand, you'll survive. Just get creative. There's a total of one cup of seeds, so if you'd rather use pumpkin seeds (or something else), feel free to do that. If you'd rather use honey, have at it. And lastly, if you can't stand dates, use 1/2 cup of your favorite dried fruit. Enjoy! 1. Line a baking sheet with parchment paper and preheat your oven to 350F. 2. In a large mixing bowl, add in your oats, almonds, chia seeds, flaxseeds, cinnamon, and sea salt. Mix well. 3. In another bowl, mix together your wet ingredients: coconut oil, maple syrup, and vanilla extract. Pour the wet ingredients into the dry ingredients. 4. Evenly combine the dry + wet ingredients. Spread the mixture onto your parchment-lined baking sheet. 5. Pop the baking sheet into the oven for 20 minutes. Mix the granola half-way through. 6. After 20 minutes, pull out the granola and add in the rest of the ingredients (coconut, pumpkin seeds, sunflower seeds). Pop the sheet back in the oven for 3-5 minutes. 7. Pull the baking sheet out of the oven, sprinkle on your chopped dates, then let the granola cool to room temp. Break into pieces and serve up! The granola will stay fresh (in your cupboard) for up to one month.